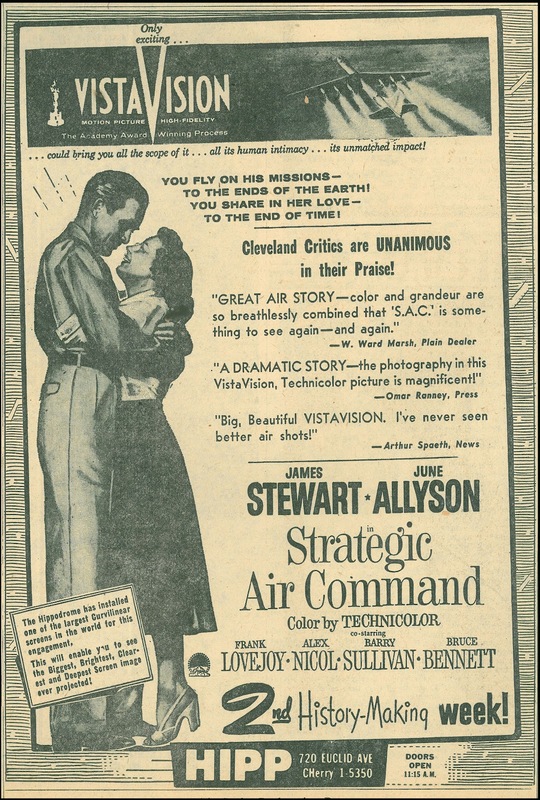 STRATEGIC AIR COMMAND (1955) --- Long-awaited in HD on a wide screen, this was streaming on Amazon Prime and did not disappoint. I don't know many service pics that convey so well addictive properties of military hardware, especially jet bombers with destructive force to made WWII combat look like Sunday picnic. 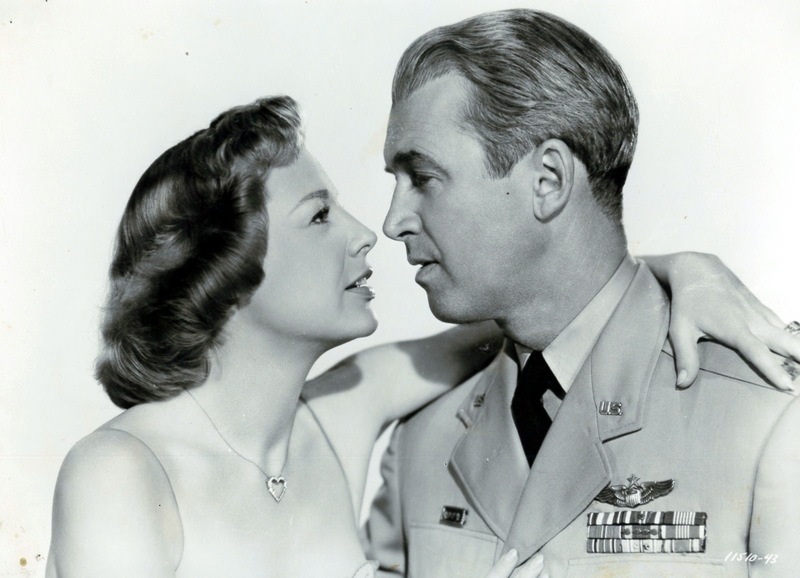 That's the firepower that makes James Stewart give up career and health to serve, then re-up to wife June Allyson's despair. Meant (naturally) to boost the Air Force, this is no rah-rah otherwise, as Jim pays dear for devotion to duty, though we readily grasp siren call of those B-47's. When Stewart gets a first glimpse of same, it's like a religious epiphany. Flight scenes are impeccably done, a result of much military cooperation, and I'm sure real-life veteran Stewart helped grease that. This must have been a wow in VistaVision, being among few that were actually exhibited horizontally in a few spots. We're not at war here, but vigilance, if not outright preparedness, is emphasized throughout. A Cold War chill pervades as JS stays in uniform to fulfill what he calls grave responsibility. You get a feeling these guys were expecting all-out war any minute, red alert lights always burning. We almost wish clingy wife June Allyson would get out of the way so Jim can easier protect us. Paramount gave SAC top priority, among other things premiering it at an Air Force base, with Stewart in attendance. There's a recent CD out of Victor Young's stunner score. Sure hope this is one of those Olive has contracted with Para to release on Blu-Ray. 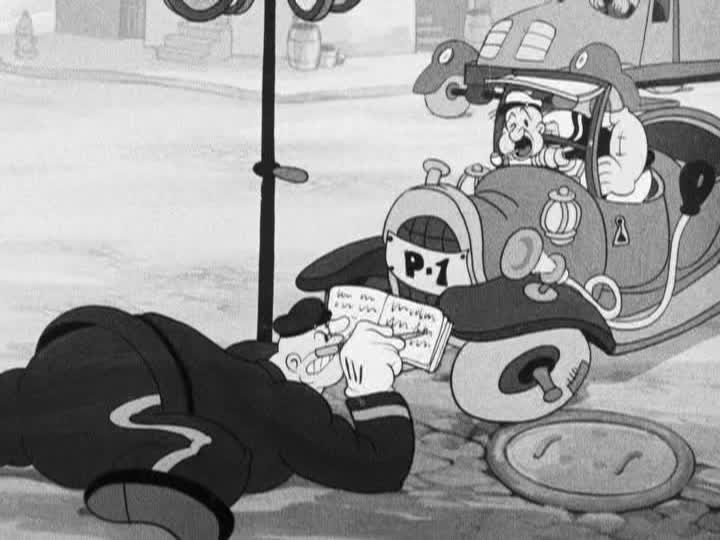 COPS IS ALWAYS RIGHT (1938) --- Bluto and spinach on sabbatical as Popeye faces police brutality and a strident, even for her, Olive Oyl, who answers his dogged devotion with heaps of abuse beyond customary levels. Was this an unhealthy relationship the sailor should have long ago got out of? He's there to help with housework and she continually snipes him. Maybe Popeye needed spinach to put down Olive oppression. The surly cop is a partial Bluto stand-in, but Popeye won't fight him back as that might be bad example for his Saturday club members in then-cross-country attendance, the sailor after all a role model to 30's moppetry. As usual miraculous animating is in play, Fleischer artists staging furniture ballet we see from overhead long shot (Popeye's room redecorations). Just moments like this make a whole cartoon worth treasuring. 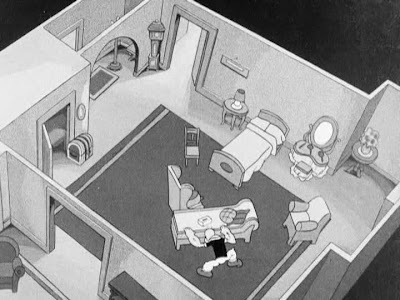 There's also dash up/down endless flights of stairs, a reality of urban apartment dwelling before elevators were commonplace (reminded me too of Buster Keaton's similar exertions in The Cameraman --- comedy and cartoon folk obviously watched each other closely). 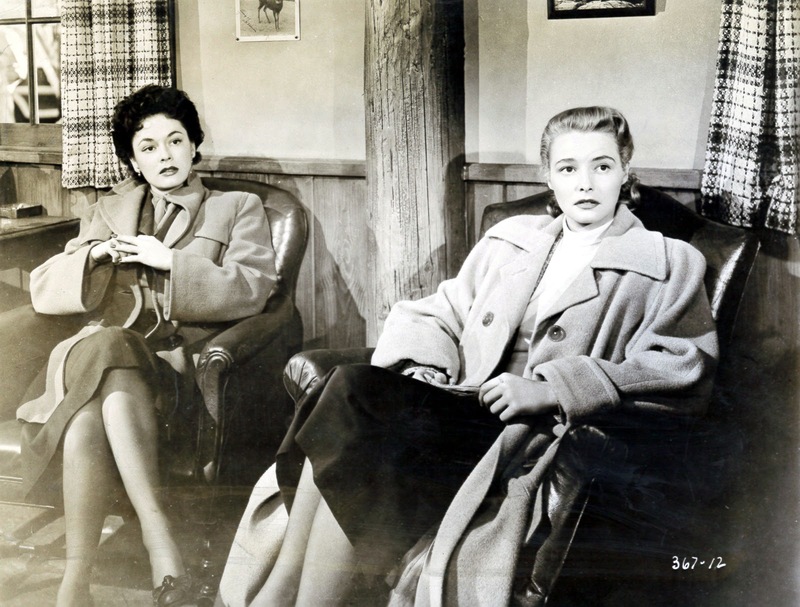 THREE SECRETS (1950) --- Plane crash and a child survivor bestirs Eleanor Parker, Patricia Neal, and Ruth Roman to notion that said tot might be one each bore illigit, then gave up to adoption, but which wins final reveal lottery? A very definition of "woman's picture" in late flowering, after Davis/Crawford et al had ceded this field to younger, less histrionically driven, contractees Parker, Neal, Roman, all given chance to demo abilities WB westerns, formula stuff obscured. I suspect Three Secrets was a script the trio revelled in, as it sure (to them, if not us) beat saddling up again with Dennis Morgan or Randy Scott. Babies born on wrong side of blankets were meller-natural to pix where mothers could take Code-prescribed licks for moral lapsing. When such is done well as here, it can still engage, despite societal change to make much of Three Secrets seem other-worldly. 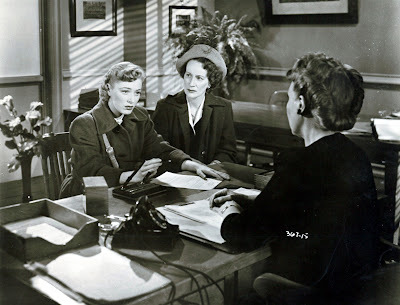 Flashbacks for the erring trio go to respective wartime conceptions when gals presumably had a tougher time saying "no," WWII urgency being what it was. No telling how many femmes among 1950 patronage experienced a same thing, but wouldn't/couldn't tell hubby/dates about it. Did Three Secrets bring about real-life confessions at home? Oldies that seem soapy to us may well have hit nerves at time of newness that we'll not appreciate for missing upheavals a '50 public could recall and still be emotional over. It wasn't just combat re-visits like Battleground that moved them. 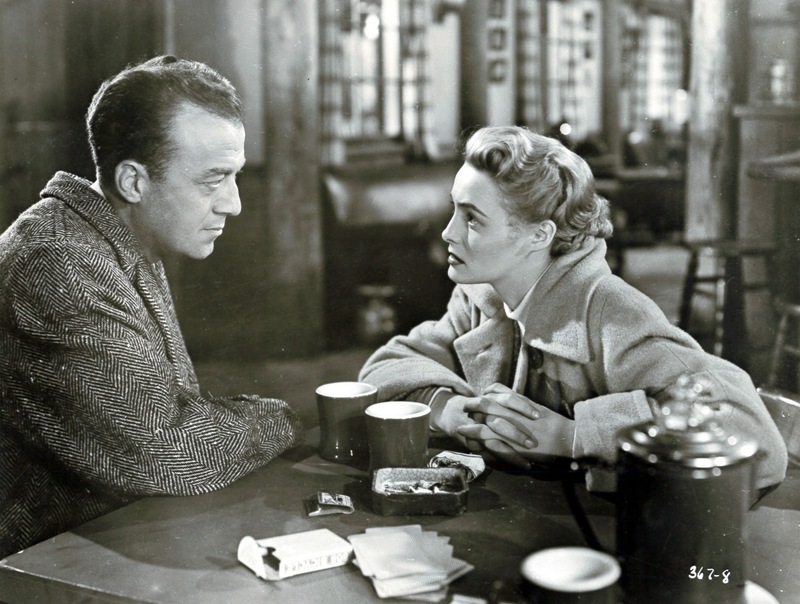 Warner polish is evident, and as always, sustaining to ones of us able to enjoy most anything bearing that shield, director Robert Wise expert as ever at handling yet another genre of many he mastered. Three Secrets surely resonated, as $799K spent on the negative was rewarded by $2.1 million coming back. Milton Sperling produced via his United States Productions, so this is another one that reverted to him and eventually made way to Paramount ownership and lease to Olive Films for Blu-Ray release. Looking good as it now does adds that much gravy. 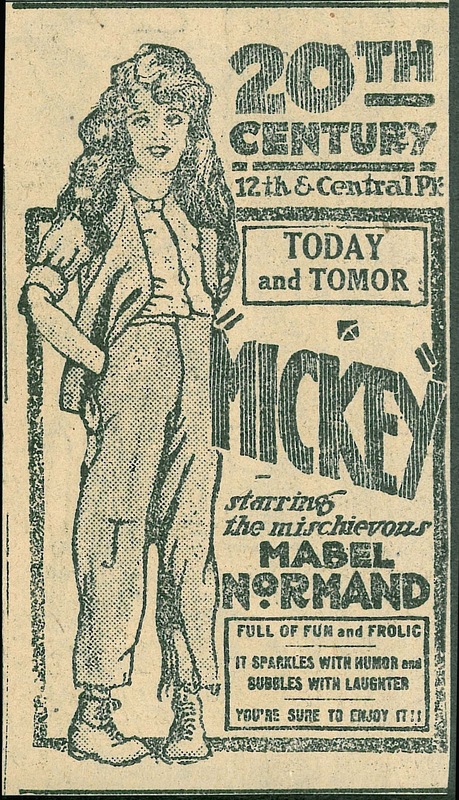 MICKEY (1918) --- Backwoods sprite Mabel Normand transplanted to city relatives who oppress her, all the while she being heiress to millions in mined gold. Precious ore in this case was taken by sock reception to Mickey, and for-while possibility that Mabel might nibble at Mary Pickford primacy. 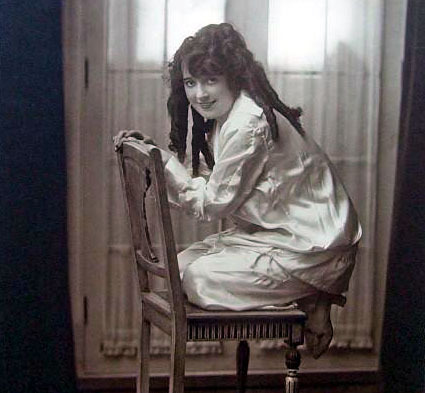 Mickey borrowed what worked for Pickford and broadens comedy to Normand's measure, she and producing Mack Sennett committed to less fall-downs and more situation, including romantic-centered ones. Mickey picks up when she leaves the sticks, rural backdrop another word for drab in much of Sennett. Mabel gets our sympathy as she did in shorts, Mickey playing to considerable strengths of this madcap who might have passed Pickford had fate been kinder. As it is, Mickey presents her at what I'd call a peak. Two versions are extant, both expected on DVD from CineMuseum, whose fine restoration of Sennett subjects was an especial TCM treat a few months back. Watched THREE SECRETS about a year ago. Not bad. 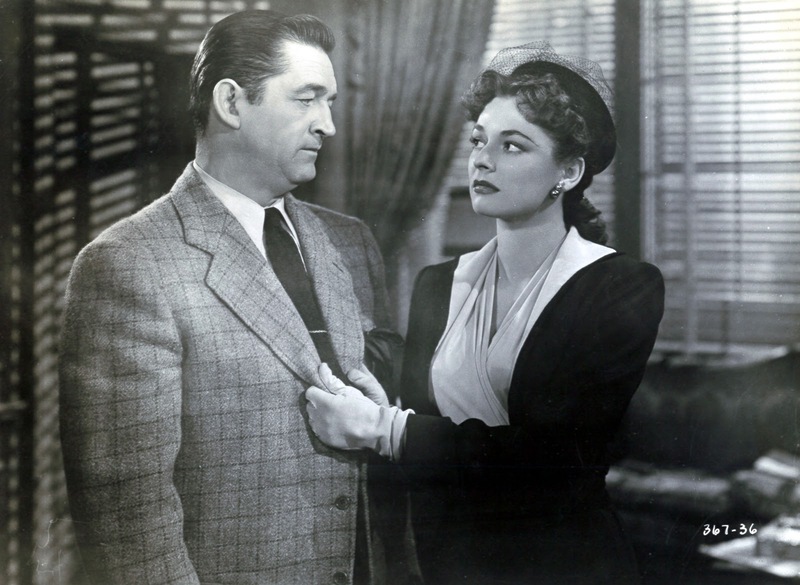 Always liked Three Secrets, good cast and well done melodrama. James Stewart must have loved doing Strategic Air Command . One of my favorites, Frank Lovejoy had a small part in it. Jimmy and June made a good team. I think they costarred three times. Oh, how I love COPS IS ALWAYS RIGHT! Ever since childhood it's been my favorite Popeye. I can't pass a parked vehicle that's clearly in need of restoration without saying "Same piece of junk!" under my breath. Jack Mercer, of course, is marvelous as that mumbling, ad-libbing Sailor Man, armed with obnoxious puns ("I'll PLANT this over here"). What a loss that he could no longer do that kind of performance during the Famous Studio era!